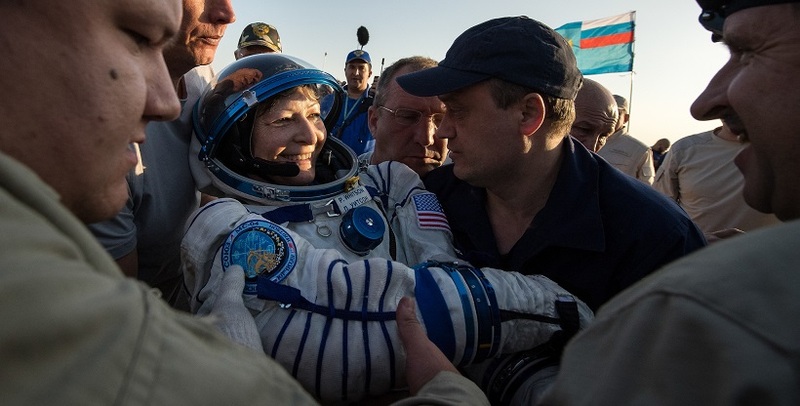 NASA astronaut Peggy Whitson, who set multiple U.S. space records during her mission aboard the International Space Station, along with crewmates Jack Fischer of NASA and Commander Fyodor Yurchikhin of Roscosmos, safely landed on Earth at 9:21 p.m. EDT Saturday (7:21 a.m. Kazakhstan time, Sunday, Sept. 3), southeast of the remote town of Dzhezkazgan in Kazakhstan. The three international crew members have been safely evacuated from the descent capsule minutes after the landing. "All the three Soyuz MS-04 crew members have been successfully evacuated, they are in good health," the Russian Mission Control Center said. Russia’s Federal Aviation Agency deployed two An-12 and one An-26 planes and 12 Mi-8 helicopters, as well as six search and rescue vehicles and other auxiliary equipment to ensure safe landing. While living and working aboard the world’s only orbiting laboratory, Whitson and Fischer contributed to hundreds of experiments in biology, biotechnology, physical science and Earth science, welcomed several cargo spacecraft delivering tons of supplies and research experiments, and conducted a combined six spacewalks to perform maintenance and upgrades to the station. Among their scientific exploits, Whitson and Fischer supported research into the physical changes to astronaut’s eyes caused by prolonged exposure to a microgravity environment. They also conducted a new lung tissue study that explored how stem cells work in the unique microgravity environment of the space station, which may pave the way for future stem cell research in space. Additional research included an antibody investigation that could increase the effectiveness of chemotherapy drugs for cancer treatment, and the study of plant physiology and growth in space using an advanced plant habitat. NASA also attached the Cosmic Ray Energetics and Mass Investigation (ISS CREAM) on the outside of the space station in August, which is now observing cosmic rays coming from across the galaxy. The crew members received a total of seven cargo deliveries during their mission. A Japanese H-II Transfer Vehicle launched to the space station in December 2016 delivering new lithium-ion batteries that were installed using a combination of robotics and spacewalks. Orbital ATK’s Cygnus spacecraft arrived at the station in April on the company's seventh commercial resupply mission. Three SpaceX Dragon spacecraft completed commercial resupply missions to the station in February, June and August. And, Russian ISS Progress cargo spacecraft docked to the station in February and June. Whitson’s return marks the completion of a 288-day mission that began last November and spanned 122.2 million miles and 4,623 orbits of the Earth – her third long-duration mission on the station. During her latest mission, Whitson performed four spacewalks, bringing her career total to 10. With a total of 665 days in space, Whitson holds the U.S. record and places eighth on the all-time space endurance list. Fischer, who launched in April, completed 136 days in space, during which he conducted the first and second spacewalks of his career. Yurchikhin, who launched with Fischer, now has a total of 673 days in space, putting him seventh place on the all-time endurance list. Expedition 53 continues operating the station, with Randy Bresnik of NASA in command, and Sergey Ryazanskiy of Roscosmos and Paolo Nespoli of ESA (European Space Agency) serving as flight engineers. The three-person crew will operate the station until the arrival of NASA astronauts Mark Vande Hei and Joe Acaba, and Alexander Misurkin of Roscosmos. Vande Hei, Acaba and Misurkin are scheduled to launch Sept. 12 from Baikonur, Kazakhstan.